Sooooo, a number of projects have come to a conclusion freeing up a little more time, and I plan to devote several hours tomorrow (Tuesday) to tying up some loose ends of Aftermath, I will list those below. Please let me know if there are any other things I need to do too, so I can get these listed properly as if they are not here now, chances are I have forgotten. 1. Meta Game; this is the big one, I plan to roll out the revisions tomorrow / Wednesday. 2. Arena; I have characters in the joust and arena which need their orders sent to the hosts. 3. Trial response; Aranor was found innocent, and this requires royal approval. 4. Begin considering Throne Room Event consequences; already a fair way with this, but more to come. 5. Aranor + Isabel PMs; these will be answered. Yes! You have to go find a November issue of National Geographic. There is an article examining some of the more mundane evidence of Viking settlements in North America. It's probably all stuff you're already familiar with, but you know. Ah cool! We have a subscription so will keep an eye out for it. Chances are there will be a little detail or two I can use. 6. Kick the hosts' butts so the other events get moving again. 3.1 - Can you fit Saeros vs. Zekic in that schedule? It could be done quicker and without the king's presence, since both aren't important people. I'd advocate just announcing a certain punishment for Zekic. Everything is in the protocols and this time it is not about what words might mean. Zekic did what he did and the king can just decide what to do about it. Since he didn't actually kill anyone, I'd say that he should have a short time to explain himself - if anything, to minimize his punishment. Of course, I will attempt to make it worse. He pulled out a crossbow in front of everyone, plushe visibly pulled the trigger. Pull out the insanity defence! Then perhaps it's best that the prosecution writes a letter to the court, asking for the sentence. I'll do it shortly. If the judges feel the need for it, then Zekic may be called to defend himself. OBJECTION! Crossbow was not loaded! I demand justice! As Sir Kamos prepared himself to carry out the Kings judgement he felt no remorse for this fanatic. Someone so undisciplined as to not contain their own hatred had it coming. He played with the crossbow in his hands waiting to be called in. As the sentencing was complete he slowly wound the string back and placed a bolt. Zedric faced his death well with a face full of hatred and rage but he did not cry of weep for pity or forgiveness. As Kamos approached the two men made eye contact with a nod among warriors prepared themselves. Finally Kamos raised the crossbow and aim it as his left eye, for what reason even he didn't even know, then he spoke. And with a solid thunk Zedric lay dead to the world making just as much an awful racket as he did in life clanging to the ground. Then two barrels of oil behind Kamos exploded followed by hordes of Demons pouring into the castle. The reign of Emperor Kamos had begun. His footsteps echoing around him, the scribe hurried up the stairs with haste born of terror. Clutched tightly in his hand was a sealed letter, the sigil of the King beginning to crack under the pressure his trembling fist applied. Finally reaching the top of the staircase, he exchanged a brief word with the duty knight, who swung open the door he guarded. With a bried nod of sympathy, the elite warrior stepped aside to allow the scribe entry to the dim, candle-lit chamber beyond. Maps, letters and financial statements lay intermingled on the central table, the only decoration being an elaborate candelabra, whose flickering light revealed a grey-haired, heavyset man with his head in his hands, asleep. Standing awkardly for a moment, the scribe finally resolved to wake the figure, and loudly cleared his throat. Sir, I bring tidings from the King! It concerns your order. The scribe stuttered into silence as the figure slowly raised his head, and reached out for the letter. Breaking the seal with his thumb, the man quickly scanned the parchment, and suddenly glared up at the quaking messenger. F***ING BALLS! THAT F***ING CROSSBOW AND THAT F***ING RANGER WITH HIS F***ING MOUTH! The cry was heard throughout Castle Aventail, and some say that even the nearby villages were disturbed by the tirade. For miles around, cows' milk curdled and chickens' eggs cracked in the nest. The guards on the walls of the fort winced as they recognised the smashing of glass, and another, weaker cry as a figure was ejected from the central tower window, to fall to the ground in a ruined heap. The reign of Emperor Kamos had begun. After word's were spoken Kamos got headshoted right between the eyes, now Zedric was avenged, And Zekic Thunion steped from darkness. 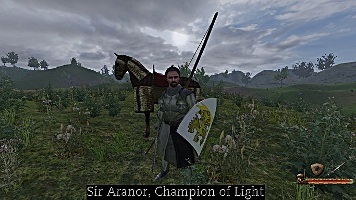 Now without they'r leader demon forces were defeated by Knights of the Gountlet(or so sources speak) and Zekic was branded as a hero of Pendor, and a new king, as former king was slain in mist of battle. Soon after Noldor forest's were burned down to the ground. From the sizzling ashes that now covered Sarleon's street, a lone man stumbled onwards; his hair had once been light-brownish, but now it was dark-red and tangled from blood. A long gash ran from his left eye to his chin. In his hands he clutched an elegant sword, wrought from steel. It glittered dimly amidst the downpour of water. 'Kamos, Kamos!' the man cried, waving his fists against the thunderous clouds as if he could somehow strike at them with his length of steel. Behind him and to his flanks the demons ravaged the city. People lay butchered everywhere around him: every street he laid his eyes on was littered with bodies. There were no living present on those streets anymore - only demons, who did not notice him from their fleshy meals. Everywhere around him there was destruction, yet the main road was empty; it led towards the keep, where lightning constantly struck, and where Kamos would surely be at. Long before the demons could notice him, his too-slender shape had disappeared inside the massive keep. He wandered on in the darkness, not knowing what he'd find behind the next corner. The darkness crept around him, sometimes throwing a sound or two to test his nerves: he had to keep himself from bellowing, then. Like this he continued, until he heard a voice from the darkness. He froze, looking wildly about himself to see where the sound had came from. His head crashed into something hard... and he realized that it had came from behind a wall. Suddenly his hands fumbled air. His eyes turned to regard the empty spot, and were suddenly caught in a brighter-than-bright flash of light. He stumbled backwards, right hand clutching his blade again. That must've been heard. In their place, there were now half-eaten bodies lying around the city, with random torn-off limbs resting everywhere. He closed his eyes, weeping softly as he ran. His tears flew on the blood-marred ground, washing it a little. Just a little.